A local charter school hosted a farm animal day during their day camp over the summer. As one of the few farmers in the area raising fiber goats, we were asked to bring one of our goats to show and explain to the children. That meant another chance to transport one of our goats off the farm. 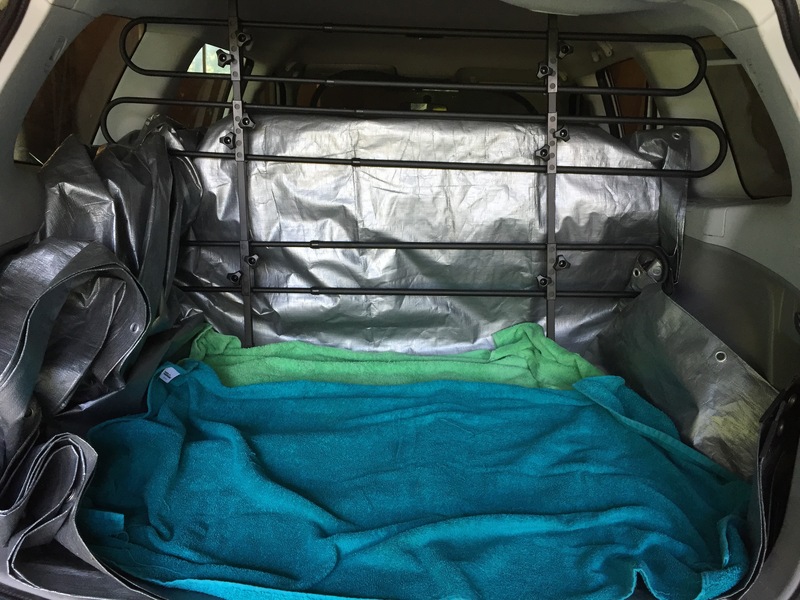 When preparing to transport a farm animal directly in the car outside of a crate when you don’t have a pickup truck or trailer, it is important to have the right set up so everything goes well and doesn’t ruin the inside of the car. 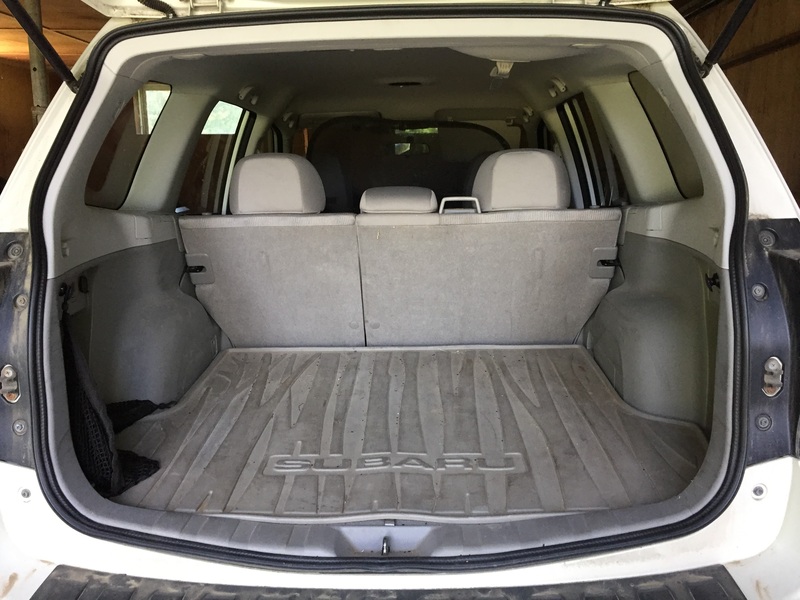 In our case, we used the cargo area of our Subaru Forester. Here is a picture before goat preparations. The cargo area before goat preparations. First, we placed a waterproof tarp over the entire area, folding up the sides where necessary so any fluids remain trapped on the tarp. Then, we installed the temporary pet barrier so the goat couldn’t jump over the back seat. Finally, we placed towels on top of the tarp so it was more comfortable and absorbent if necessary. Horses have a lot of paraphernalia. To store it all, a horse owner usually has at least 1 tack box. As we have a horse, we were in need of a tack box to store at least some of our horse’s tack at the stable. I decided to try and see if I could make a tack box instead of buying it. It turned out to be very easy with 3 easy steps (and a 4th optional step if desired). Step 1: Search all of your property (especially outbuildings and old barns) for an old tack box or trunk and select the one you want to use. 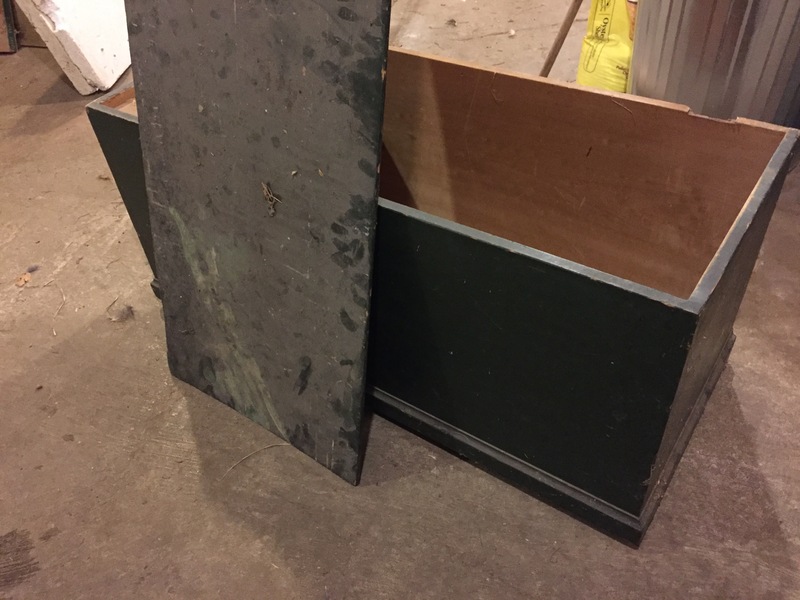 I started by checking the piles of items in hayloft to see if there were any old trunks or crates that could serve as the starting point for a tack box. It turned out that there was a dusty, old, broken trunk in the hayloft. The base was mostly intact but the hinges were broken and had ripped off the box. I found the missing lid nearby. Here is the old, broken box from the hayloft. I brought it down from the hayloft and dusted it off. There were some faded and stained portions on the exterior, but other than the broken hinges, it was overall in pretty good shape. Now that you have your basic tack box located, it’s time to move to Step 2. Click through for the rest of the steps. The day old chicks we were raising outgrew their cage in the house after about 4 weeks. They were ready to move outside to the barn. They didn’t need the heat lamp any more and were ready for more space and fresher air (the house needed to be aired out by that point as well!). 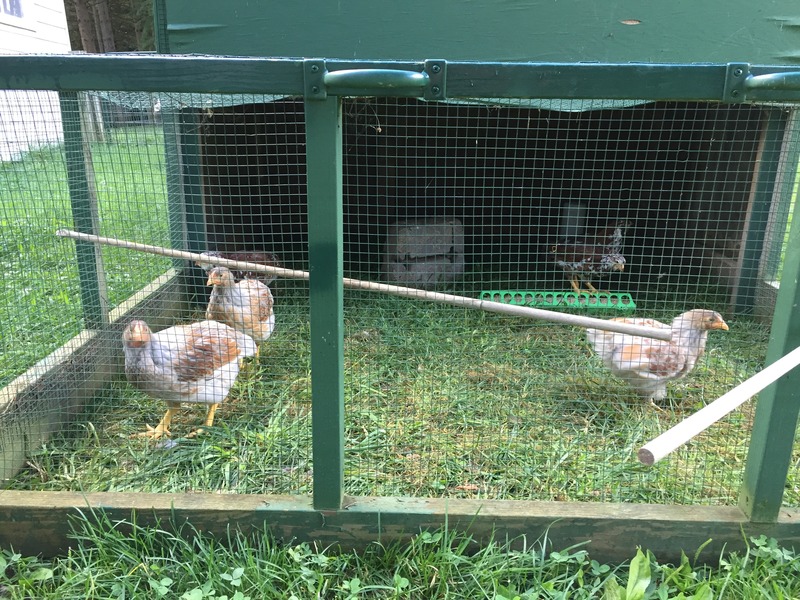 I used an outdoor pet exercise pen and covered the outside with chicken wire to make sure the chicks couldn’t squeeze out between the bars. I added a wooden crate and a cement block inside to give them something to climb and roost on. The floor is covered with pine shavings to help maintain cleanliness and provide the chicks with something to kick through. 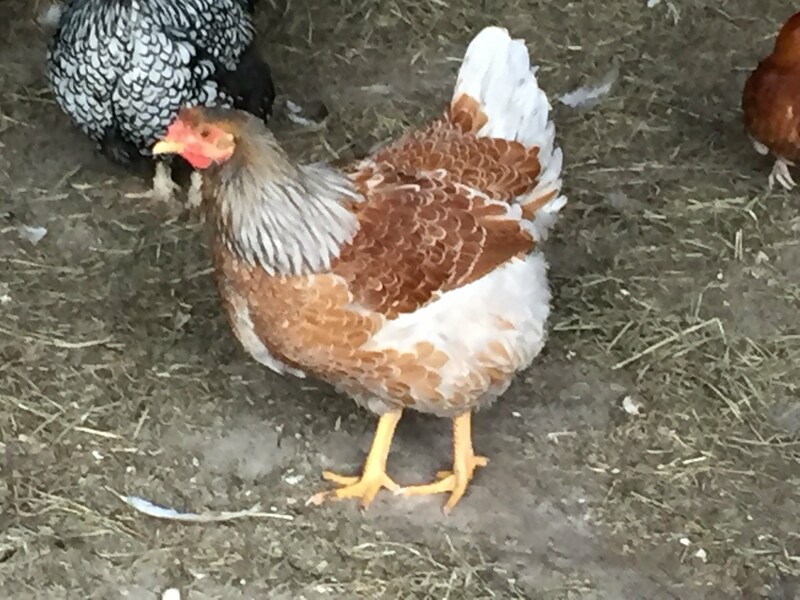 The roof over the pen was just a scrap of wood from the barn to prevent them from flying out and any other chickens from getting in. Four week old chicks out in the barn. Click through for a video and more photos of the baby chicks. You may recall that we got the chance to bottle feed an orphaned calf last year at a neighbor’s farm. 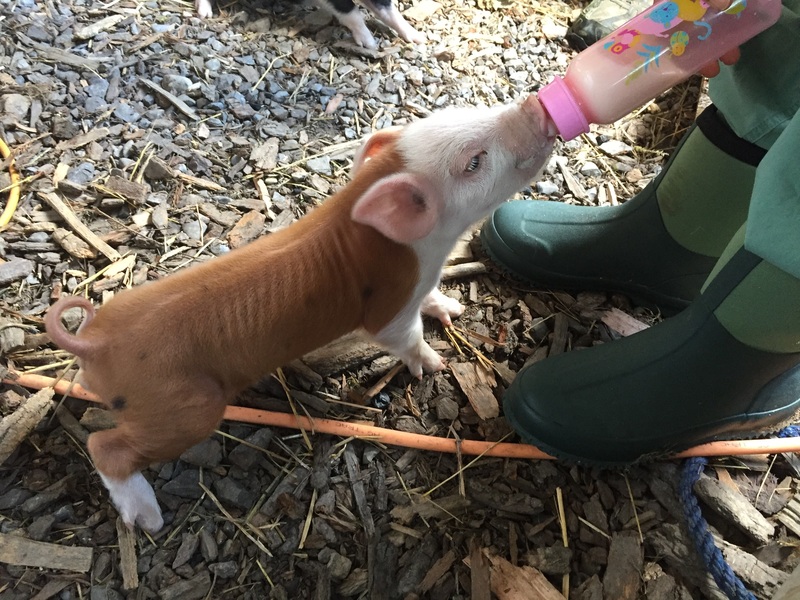 This year, there wasn’t an orphaned calf, but there were some orphaned piglets that my neighbor took in to raise. He let us stop by to help with one of the bottle feedings earlier in the summer. Our neighbor took in 3 of the piglets from the litter. He had 2 black and white piglets and 1 red piglet. With a good portion of our pasture surrounded by woods, we sometimes get a chance to see young birds learning to fly – they take off from the trees on the edge of the pasture and flap / glide into the field. The pastures are relatively safe as the fences block most ground predators. 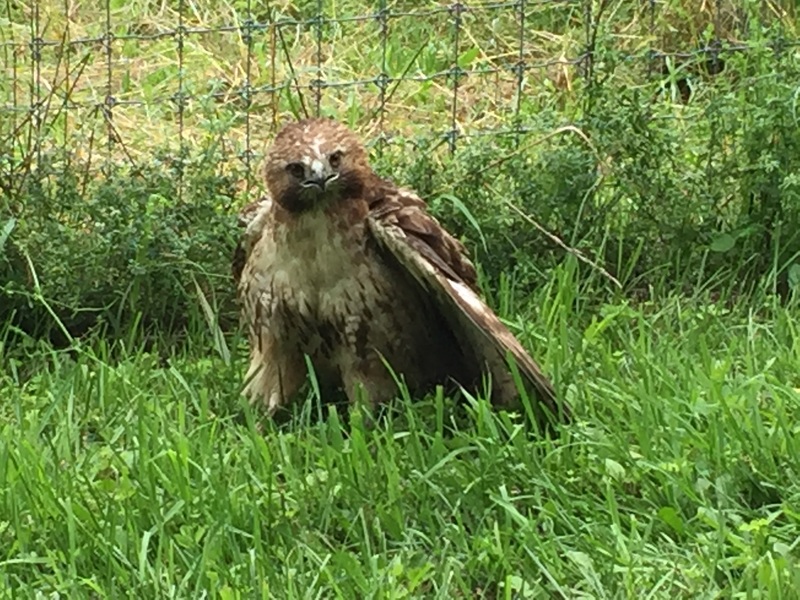 This year, a juvenile red-tailed hawk came to our pastures to practice flights. However, on one attempt, the hawk’s foot got stuck in the fence and the hawk was stuck hanging on the fence, unable to get free. By the time we noticed and began to approach, the hawk was able to free itself, but was still either in shock or needed to rest. It sat on the ground near the fence for a couple of hours before flying away. We checked on it periodically to make sure it wasn’t permanently injured and didn’t need any human intervention. 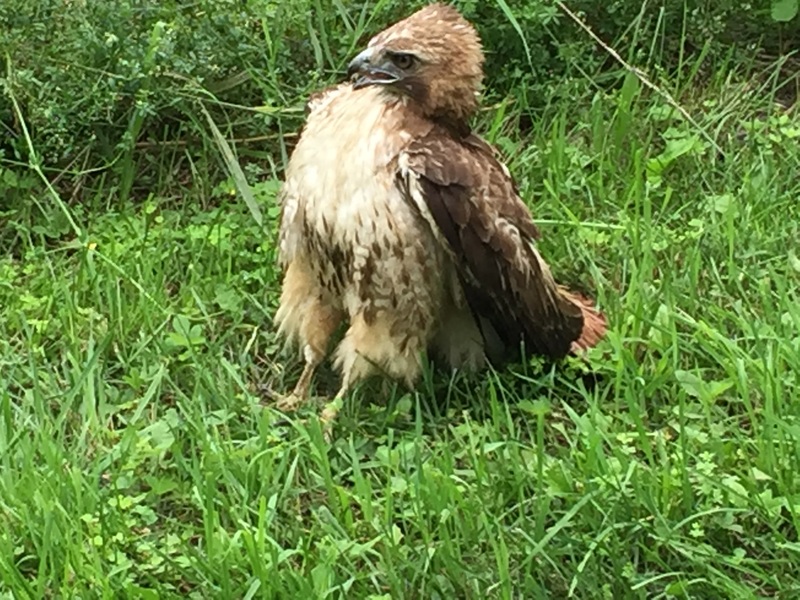 Juvenile red tailed hawk on the ground. Here is a video of the hawk on the ground, turning its head to watch us closely as we approach. We saw the hawk around the area for the next few days afterwards, but it always flew away before we could get anywhere close it. 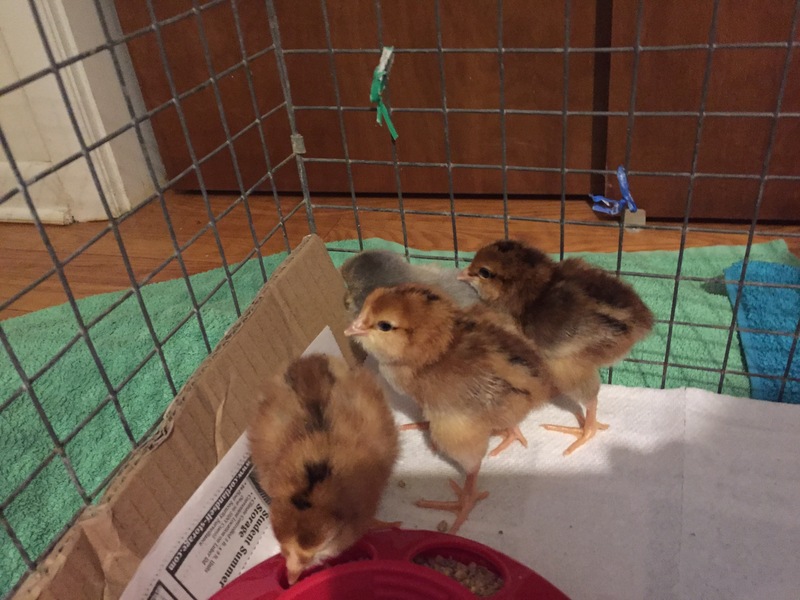 New arrivals: we bought 6 day-old chicks! 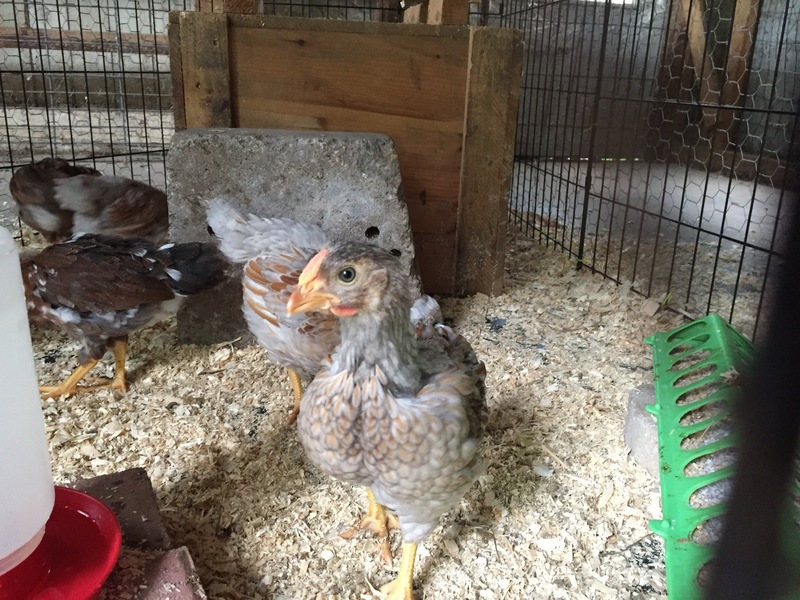 Last year, we raised 3 bantam Cochins but they were already 6 weeks old when we got them. 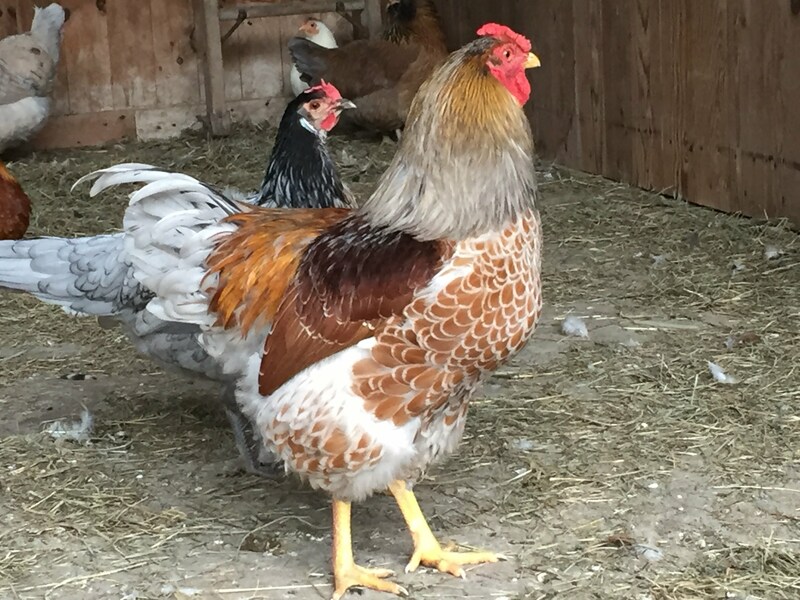 We also picked up a couple of hens from the NY state fair, but those were already grown. This year, we decided to try starting with day old chicks. We picked up our chicks from a local hatchery and brought them home in a small shoebox with a few air holes. They chirped loudly most of the drive home. The chicks try to hide from the camera in the corner of their cage. They are very cute and fluffy! Click through for some more pictures! We heard about a dog that was having some trouble at the same shelter in New Jersey from where we adopted Shaffron. He was overly stressed at the shelter and had to be placed in a foster home. However, his first foster home was moving and they couldn’t take him to the new location so he had to go back into the shelter. 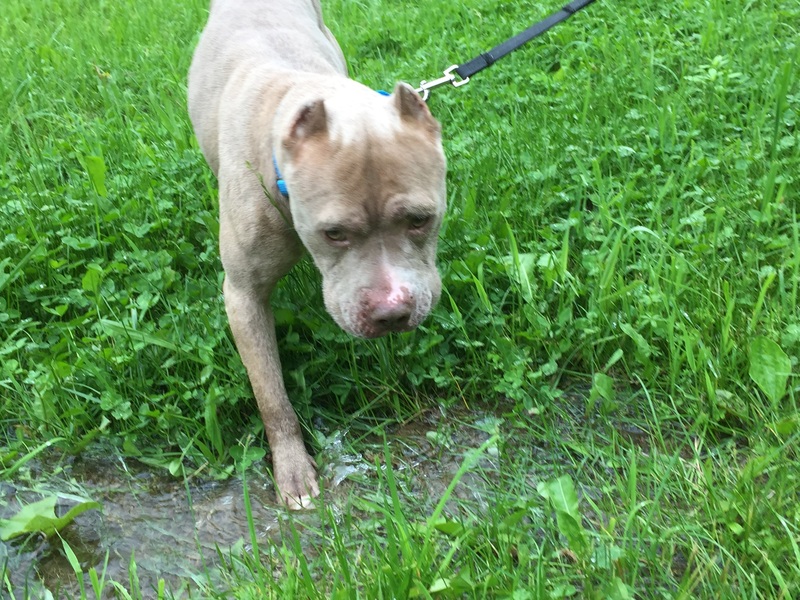 At the shelter, he was so stressed in the shelter that he drooled so much that he dehydrated himself within hours. We decided to foster him until he can find a permanent home. His shelter petfinder page is here. The shelter is calling him Pretty Boy but we are calling him Billy (because that’s way better). Some volunteers drove him the almost 4 hours up to our house. We took him for a walk around the pastures and while he was a bit shy at first, he really liked the quiet open spaces. 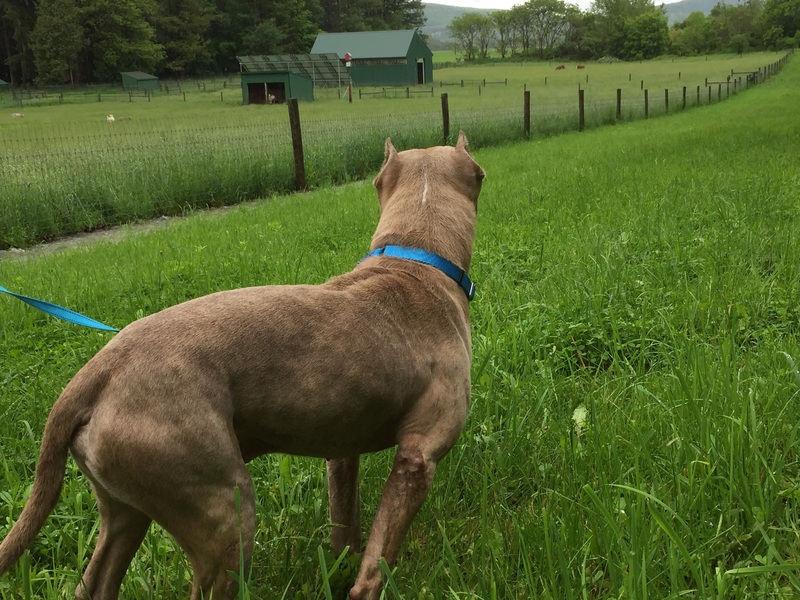 Billy looks out over the pastures. Here is Billy walking through a puddle. Billy walking through the water. A couple weeks ago, a small hawk caught and killed a small bird just off the porch in our back yard. After a bit of research, I think it was a Cooper’s hawk. 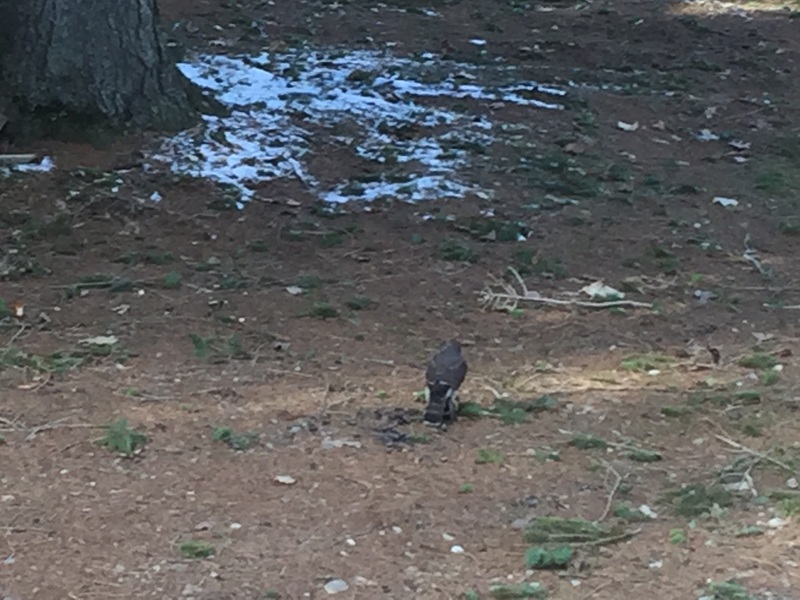 Unfortunately, by the time, I got outside to get some closer pictures, the hawk had already flown away with its meal. 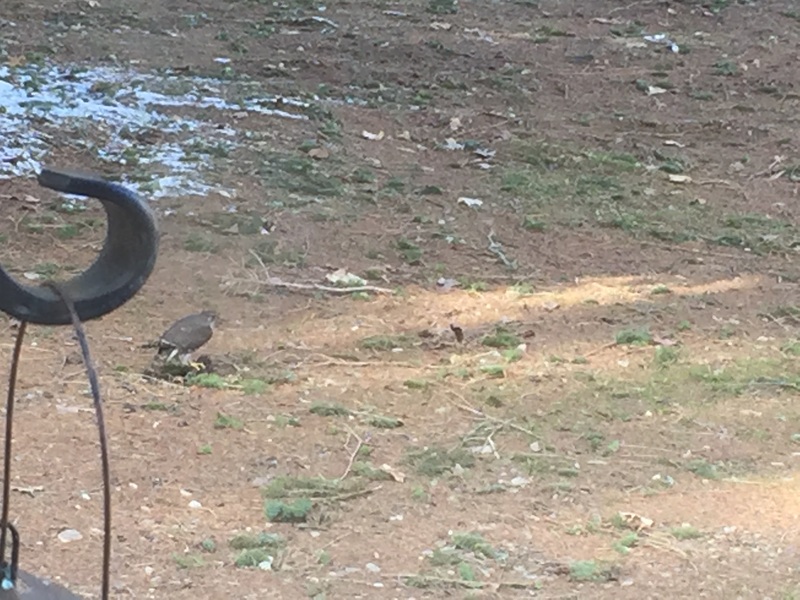 A picture of a Cooper’s hawk in the backyard. Cooper’s hawks mainly eat small birds caught in flight and the hawks are too small to seriously bother our chickens. The hawk on top of its kill. Click through for a video of the hawk removing the feathers.